What a crazy, wonderful, once-in-a-lifetime trip. Everything went so smoothly, and we had so much fun. Stephanie & Stacey from Media Tonic, and Rick from Disney were all so gracious and just as excited to have us as we were to be there. I have so much to tell, but let’s start with the contest. Monday morning was “The Event”, as everyone seemed to call it. At 9:00 a limo showed up at our hotel (the Sheraton Universal, very nice) to take us to the Los Angeles Equestrian Center in Burbank. When we arrived there were people everywhere working on setting the stage for The Event. 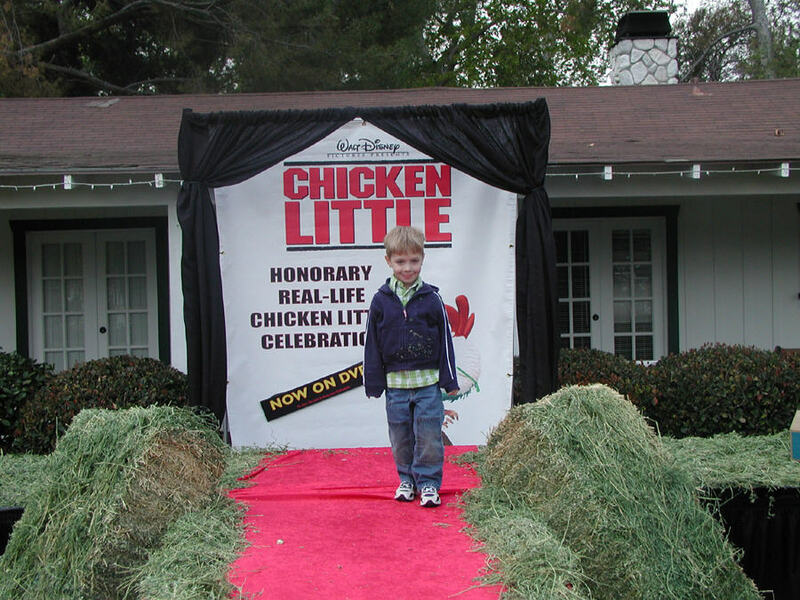 A red carpet runway, stunt chickens, and hay set the scene. Soon it was time for Miss Silkie to strut her stuff. This is the movie’s producer, Randy Fullmer, chatting with her. The contestant from Kentucky was “Elvira”, a modern game bantam. She was a dainty little thing, looking almost like a miniature wild turkey. 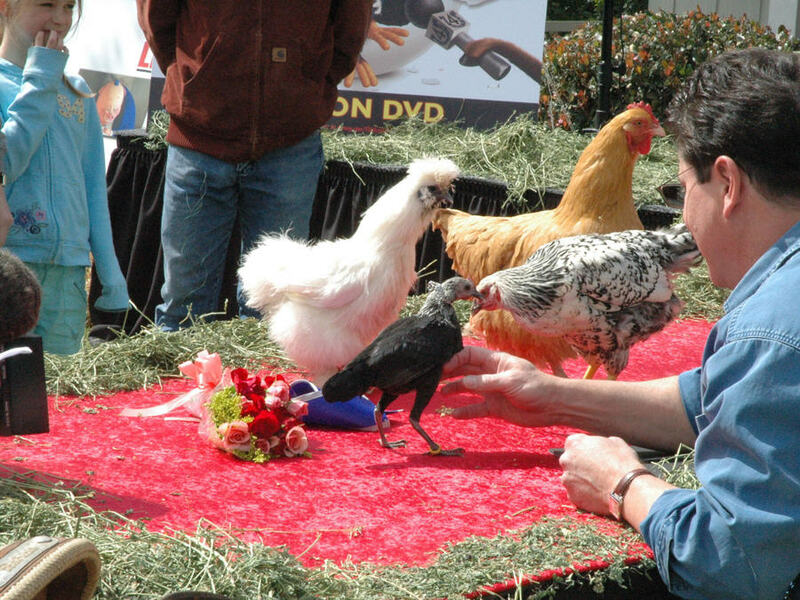 Miss Silkie, Elvira, and a couple of Hollywood stunt chickens with producer, Randy Fullmer. Elvira is wearing her crown around her neck, her sash and flowers nearby. Elivra was declared the winner by several inches. In true Hollywood fashion, Miss Silkie acted the part of the bitter runner-up by pooping on Elivra’s bouquet of flowers. 10 Responses to What a Trip! How VERY cool – congratulations! Can’t wait to hear more about it! 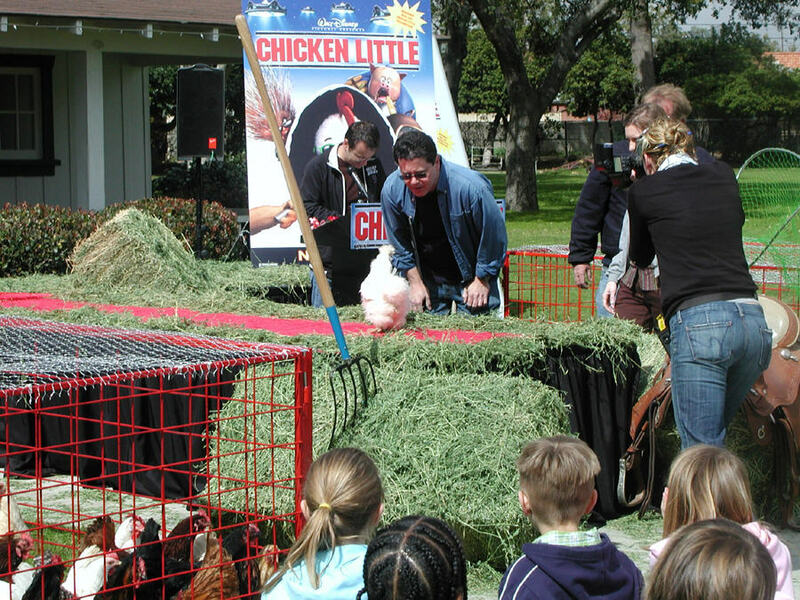 What a unique experience for your kids (and your chicken, lol)! I am sure this is a story that will be talked about for years!Strange though, to think that your dream of farming lead you to such a Hollywood adventure! That is way cool! Congratulations! What an awesome experience!Can’t wait to hear more about it! Congratulations anyway. Just the trip was a big win. Welcome back! Glad you had a good trip. What an amazing experience!Great this Hollywood event!Congratulations! I am looking forward to see the next news and photos! I’m loving the pictures. And although Elvira may have one, Miss Silkie is just tons more beautiful. I love her response to being 2nd place! LMAO!! This whole story is so fantastic! How did they find you? Did they find you through your blog? Miss Silkie was perfect, the judges were crazy not to pick her. 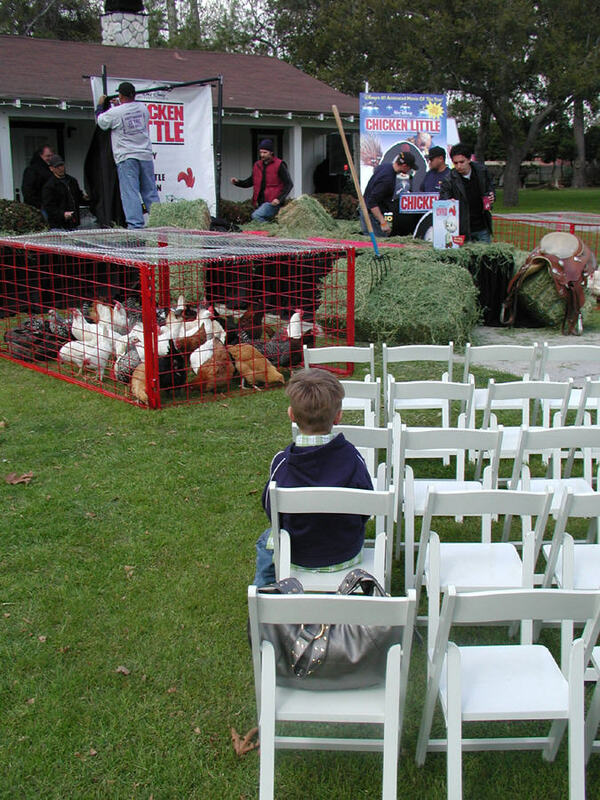 Stunt chickens????? Never kwew there was such a thing.